A transitional military government has assumed control over Sudan after President Omar al-Bashir was ousted from power by the Sudanese Armed Forces early on Thursday and placed under house arrest, according to a statement delivered on Sudanese national television by Defense Minister Awad Ibn Auf. 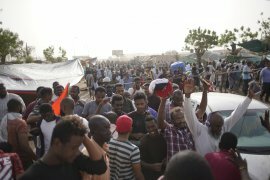 In the televised address that ended Bashir’s nearly 30-year rule, Ibn Auf announced a one-month daily curfew, a three-month state of emergency and a two-year-long transitional period of military rule until “free and fair elections” could be held to elect a democratic Sudanese government. This decision sits alongside a long list of measures that the military would put into effect immediately, including the dissolution of Sudan’s Constitution, president’s office, Cabinet, Parliament and a number of other state bodies. The defense minister also called on armed resistance forces to join the government’s transition efforts and asked citizens to maintain peace. However, the defense minister did not announce who would sit atop the transitional military government, stating that a second communiqué would be issued to announce the members. The lack of clarity throws into stark relief what an Egyptian government source who has been in touch with officials in Khartoum says is “disagreement among top generals” over who will lead Sudan going forward. The suggestion of conflict among the military and political figures negotiating Bashir’s successor is echoed by a junior officer within the Sudanese military, who tells Mada Masr that there had been “multiple coup attempts” occurring in parallel in the hours before Ibn Auf’s announcement. This “disagreement” played out amid hours of waiting for an official announcement to come, after a Sudanese military source told Mada Masr early on Thursday morning that Bashir was being removed from power and Sudanese national television suspended broadcasting and informed viewers that the military would make an “important statement” shortly.